The investment-banking world is still risky, and Goldman Sachs knows what it has to do to handle those risks. Goldman Sachs Tower. Source: Wikimedia Commons. Goldman Sachs (NYSE:GS) is a leader in the investment-banking world, with popular opinion about the Wall Street giant ranging from admiration for its financial prowess to scorn for its behavior during the financial crisis. Even though Goldman Sachs has done a good job of recovering from the worst of the market meltdown five years ago, its stock price has lagged behind peers Morgan Stanley (NYSE:MS) and JPMorgan Chase (NYSE:JPM), and Goldman Sachs faces many risks that could hurt its future ability to stay strong in the investment-banking world. Goldman Sachs Total Return Price data. Source: YCharts. To help you understand those risks, all companies in the stock market are required to identify what they see as their most important risk factors when they file their annual reports with the Securities and Exchange Commission. Let's take a look at three of the biggest risks that Goldman Sachs identified for shareholders to consider to help guide your analysis of its coming earnings results next week. 1. Market behavior affects Goldman Sachs in many of its different businesses. Perhaps the most obvious risk that Goldman Sachs faces along with Morgan Stanley, JPMorgan Chase, and every other company with investment-banking operations comes from the financial markets. For Goldman Sachs, different market factors affect the bank in different ways, some of which offset each other but some of which amplify overall risk. For instance, Goldman Sachs often takes positions in securities in order to facilitate client transactions, and although the bank takes steps to hedge the resulting exposure, its hedging efforts don't always match perfectly with the risk Goldman takes on. As a result, drops in asset values can fall through to Goldman's bottom line. Similarly, with Goldman Sachs' asset-management business, revenue based on a percentage of assets under management falls when markets decline. That obviously hasn't been a factor lately, with prices of stocks and bonds generally having moved higher. 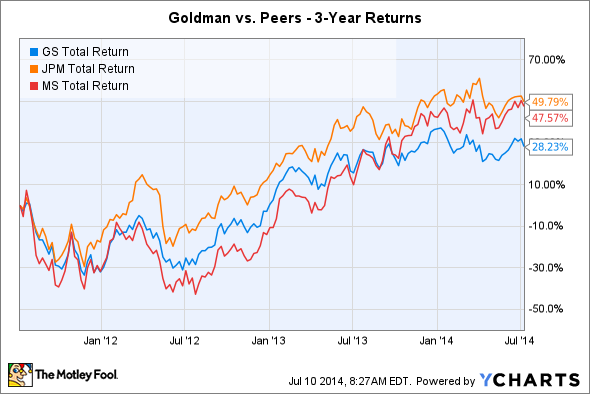 Yet some of Goldman's businesses have actually been hurt by recent market conditions. Goldman Sachs has extensive market-making operations, and there, profit depends more on the amount of trading activity in any given market. Lack of volatility has taken away some profit opportunities, yet a big rise in volatility could create illiquidity and cause other problems. Goldman has to walk a fine line in order to balance these countervailing risks and avoid losses. 2. Expansion into new areas is exposing Goldman to unfamiliar and enhanced risks. Because of tighter regulation, Goldman Sachs has had to come up with new ways to find profitable business opportunities. In particular, some of the business initiatives that Goldman has pursued include moving into regions of the world where it hasn't traditionally had an extensive presence, including emerging and frontier markets. Those lesser-developed markets don't always have the level of sophistication that Goldman Sachs sees elsewhere, and counterparties there aren't as strong as JPMorgan Chase, Morgan Stanley, and other counterparties that Goldman works more extensively with in domestic and developed international markets. In addition, Goldman Sachs has taken on exposure to various public-services projects, including taking ownership interests in airports, toll roads, and shipping ports. Those projects can be extremely profitable, but they require Goldman to work directly with government entities and can introduce additional regulatory scrutiny. As Goldman expands in these areas, investors should watch to see if they have a negative impact on Goldman's reputation around the world. 3. Commodities-related businesses are a hot-button issue for regulators. Goldman Sachs specifically calls out its commodities businesses as having a heightened risk profile. In situations where Goldman directly owns physical commodities, worst-case scenarios involve acts of terrorism or other catastrophic events that could both force the investment bank to renege on supply agreements as well as causing collateral damage and sometimes-uninsurable losses. Regulators have seen these potential risks and have sought to increase regulation of commodities-related activities. Those regulatory moves have led many investment banks to divest themselves of commodity exposure. JPMorgan Chase sold its materials-trading unit to Mercuria Energy Group a few months ago, and last month, Morgan Stanley agreed to sell its oil storage business to NGL Energy Partners for $200 million. Yet although Goldman Sachs has decided to sell its metals warehousing unit, it remains committed to the commodities business more generally, and that has some investors worried about potential liability in light of past controversies. When Goldman Sachs issues its quarterly report, keep these three risks in mind. By seeing how Goldman Sachs addresses these risks, you can assess not only how it has done in the past but also what its future will look like. Click here to add Goldman Sachs to My Watchlist, which can find all of our Foolish analysis on it and all your other stocks.